The Sanskrit name Surya refers to the sun and Namaskar means 'salutation'. In Yoga, the sun is represented by Pingala or Surya Nadi, the Pranic channel which carries the vital, life-giving force. 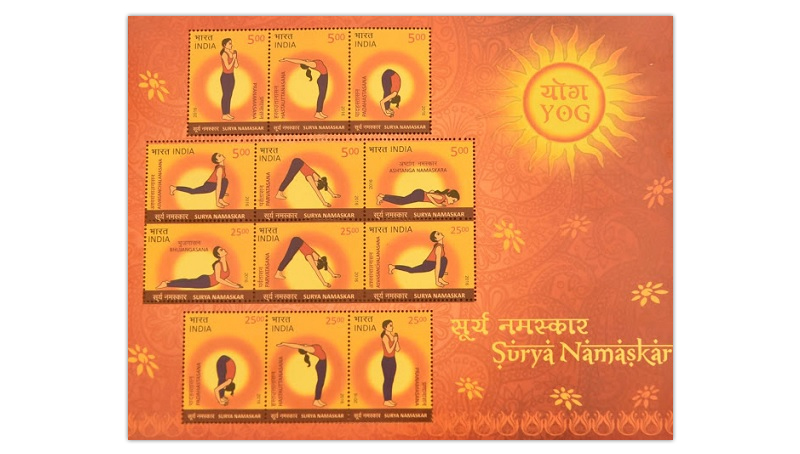 Surya Namaskar has a direct vitalizing effect on the solar energy of the body which flows through Pingala Nadi. Regular practice of Surya Namaskar regulates Pingala Nadi, whether it is under-active or over-active, that leads to a balanced energy system at both mental and physical levels. Surya Namaskar is an effective way of loosening up, stretching, massaging and toning all the joints, muscles and internal organs of the body. Pranamasana (prayers pose): Stand with the feet together or slightly apart, and the arms hanging loosely by the side of the body. Close the eyes gently and become aware of the whole physical body as one homogeneous unit. In this position the body may sway from side to side or backward and forward_ Try to minimize this oscillation and balance the body weight equally on both feet. Slowly bend the elbows and place the palms together in front of the chest in Namaskar Mudra, mentally offering homage to the sun, the source of all life. The awareness may be kept on the chest area. Hastauttanasana (raised arms pose): Raise and stretch both arms above the head. Keep the arms separated, shoulder width apart. Bend the head, arms and upper trunk backward. The awareness may be kept on the stretch of the abdomen and expansion of the lungs. Padahastasana (hand to foot pose): Bend forward until the fingers or palms of the hands touch the floor on either side of the feet. Try to touch the knees with the forehead. Do not strain. Keep the knees straight. The awareness may be kept on the pelvic region. Asvasanchalanasana (equestrian pose): Place the palms of the hands flat on the floor beside the feet. Stretch the right leg back as far as possible. At the same time, bend the left knee, keeping the left foot on the floor in the same position. Keep the arms straight. In the final position, the weight of the body should be supported on the hands, the left foot, right knee and toes of the right foot. The head should be tilted backward, the back arched and the inner gaze directed upward to the eyebrow centre. The awareness may be kept on the stretch from the thigh to the chest or on the eyebrow centre. Parvatasana (mountains pose): Take the left foot back beside the right foot. Simultaneously, raise the buttocks and lower the head between the arms, so that the back and legs form two sides of a triangle. The legs and arms should be straight in the final position. Try to keep the heels on the floor in the final pose and bring the head towards the knees. Do not strain. The awareness may be kept on relaxing the hips or on the throat region. Ashtanga Namaskara (salute with eight parts or points): Lower the knees, chest and chin to the floor. In the final position only the toes, knees, chest, hands and chin touch the floor. The knees, chest and chin should touch the floor simultaneously. If this is not possible, first lower the knees, then the chest, and finally the chin. The buttocks, hips and abdomen should be raised. The awareness may be kept on the abdominal region. Bhujangasana (cobra pose): Lower the buttocks and hi ps to the floor, straightening the elbows, arch the back and push the chest forward into the cobra pose. Bend the head back and direct the gaze upward to the eyebrow centre. The thighs and hips remain on the floor and the arms support the trunk. Unless the spine is very flexible the arms will remain slightly bent. The awareness may be kept on relaxation of the spine. Parvatasana (mountains pose): This stage is a repeat of position 5. From Bhujangasana assume Parvatasana. The hands and feet do not move from position 7. Raise the buttocks and lower the heels to the floor. The awareness may be kept on relaxing the hips or on the throat region. Asvasanchalanasana (equestrian pose): This stage is the same as position 4. Keep the palms flat on the floor. Bend the left leg and bring the left foot forward between the hands. Simultaneously, lower the right knee so that it touches the floor and push the pelvis forward. Tilt the head backward, arch the back and gaze at the eyebrow centre. The awareness may be kept on the stretch from the thigh to the chest, or on the eyebrow centre. Padahastasana (hand to foot pose): This position is a repeat of position 3. Bring the right foot forward next to the left foot. Straighten both knees. Bring the forehead as close to the knees as possible without straining. The awareness may be kept on the pelvic region. Hastauttanasana (raised arms pose): This stage is a repeat of position 2. Raise the torso and stretch the arms above the head. Keep the arms separated, shoulder width apart. Bend the head, arms and upper trunk backward. The awareness may be kept on the stretch of the abdomen and expansion of the lungs. Pranamasana (prayers pose): This is the final position and is the same as position 1. Bring the palms together in front of the chest. The awareness may be kept on the region of the heart. a) In position 16, instead of stretching the right foot backward, stretch the left foot back. b) In position 21, bend the right leg and bring the right foot between the hands. 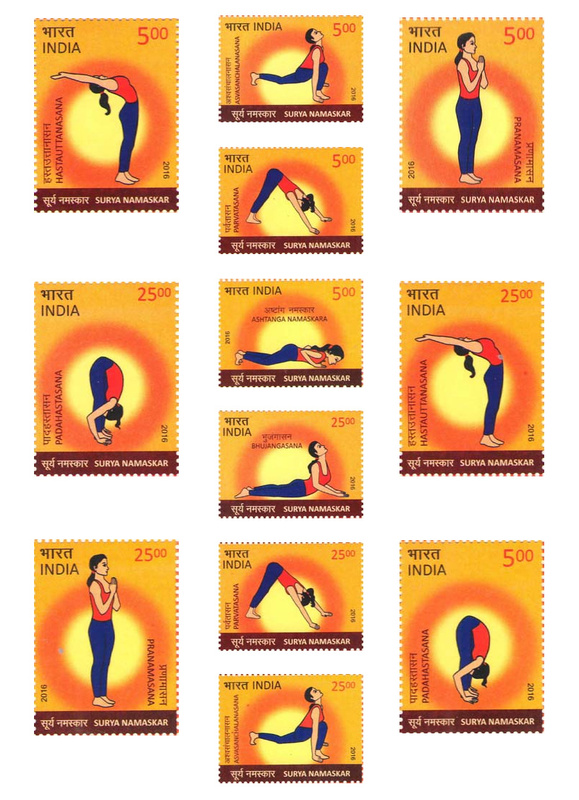 The ideal time to practice Surya Namaskar is at sunrise, the most peaceful time of the day. Whenever possible, practice in the open air, facing the rising sun. Sunset is also a good time to practice as it stimulates the digestive fire. Surya Namaskar, however, may be practiced at any time Provided the stomach is empty. Surya Namaskar is ideally practiced before other Asanas. After completing Surya Namaskar, practice Shavasana for a few minutes. This will allow the heartbeat and respiration to return to normal and all the muscles to relax. Surya Namaskar is a complete Sadhana, spiritual practice, in itself for it includes Asana, Pranayama, Mantra and meditation techniques. It stimulates all the systems of the body, including the reproductive, circulatory, respiratory and digestive systems. Its practice makes the practitioner physically fit, mentally alert and emotionally balanced. 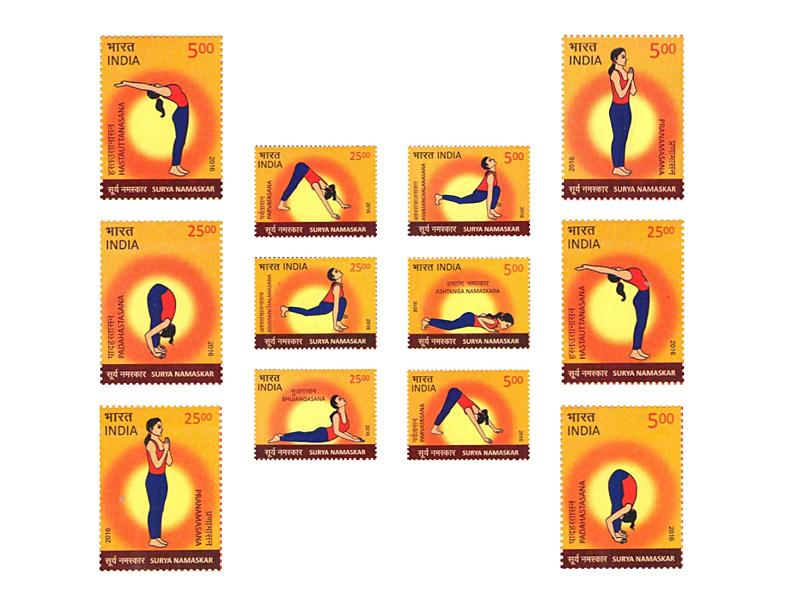 Surya Namaskar is the ideal practice to increase awareness, and bestow good health and wellbeing. In Vedic Sanskrit, yoga (from the root yuj) means "to add", "to join", "to unite", or "to attach" in its most common literal sense. is a practitioner of yoga. Cartoon character Yogi Bear does nothing to do with Yoga. 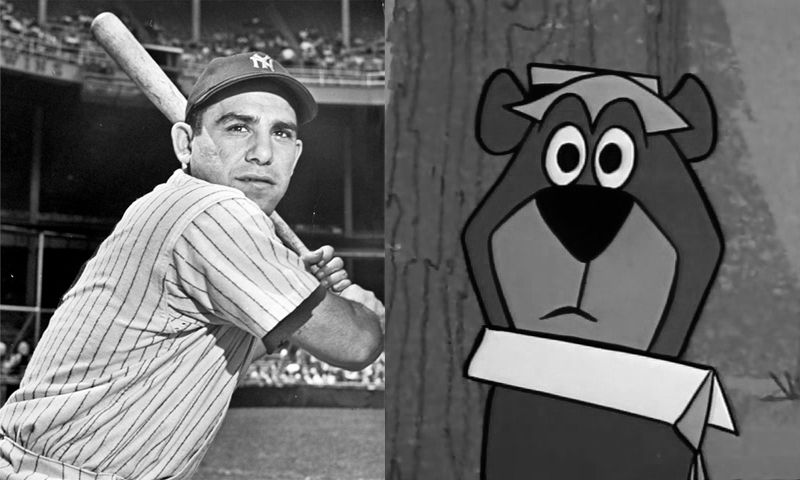 Yogi's name was similar to that of contemporary baseball star Yogi Berra, who was known for his amusing quotes, such as "half the lies they tell about me aren't true." Berra sued Hanna-Barbera for defamation, but their management claimed that the similarity of the names was just a coincidence. Berra withdrew his suit, but the defense was considered implausible.